Thousands of people filled Oakland’s downtown square. Protesting the shooting of Oscar Grant III, an unarmed young black man, by a Bay Area Rapid Transit police officer, the group was becoming increasingly agitated. One of the Department of Justice’s Community Relations Service (CRS) conciliators was on the scene, getting a feel for the crowd and determining how best to reduce the hostility. Then a bus—with people inside—passing through the area began to rock. The Community Relations Service was established by the Civil Rights Act of 1964 to help prevent and resolve community conflicts related to racial and ethnic tension. With the Matthew Shepard and James Byrd, Jr. Hate Crimes Prevention Act of 2009, CRS’ mandate expanded considerably to include prevention of and response to hate crimes committed on the basis of gender, gender identity, sexual orientation, color, religion, disability, and national origin, along with race and ethnicity. To accomplish its mandate, CRS has a small staff of 60 employees, 35 of whom are conciliators, spread across 15 offices. CRS conciliators are sent into situations of current or recent unrest triggered by one of the categories mentioned in the relevant laws. For instance, CRS’ first responsibility was to negotiate a non-violent truce between Martin Luther King and Alabama law enforcement. Conciliators met with Sikh and other community leaders mere hours after the 2012 gudwara shooting in Oak Creek, Wisconsin. CRS conciliators also facilitated negotiations between Florida Governor Rick Scott and protestors of Florida’s Stand Your Ground law who staged a sit-in at Scott’s office. Using negotiation and mediation skills, they work with the community to contain, resolve, and prevent violence. His intervention, prevention, and management work has challenged Lum to exercise his “off-hand,” a basketball term for a player’s weaker side. 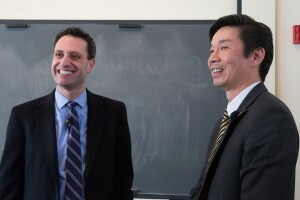 He used the analogy to encourage students to continue expanding their communication skills toolbox long after they leave “Negotiation Workshop.” Lum highlighted the “Negotiation Workshop” lessons he has used in practice—and not just as a mediator, conflict management consultant, or CRS Director. He related the story of his Senate confirmation process, where he reframed many of his answers in ways that met the senators’ interests. He also discussed how he uses the Difficult Conversations framework to bring up issues with his supervisors or supervisees. The most frequently employed skill he gained from “Negotiation Workshop,” though, is active listening. So few people feel heard, so whether a lawyer is in the office or in the midst of protesters, actively listening can change relational dynamics for the better. The transferability of “Negotiation Workshop” skills is good news for the students listening to Lum. After the workshop, many students express interest in entering the dispute resolution field. Yet Lum sees a trend in the legal field generally that will allow any future lawyer to advocate for more collaborative processes. “I do see a paradigm shift,” he assured students. “You can take any job and make it more of a dispute resolution job.” There are certainly enough conflicts—in communities, in offices, in the world—that need problem-solving lawyers like Grande Lum.